I am searching for the former occupant of the Presidential Villa who did not leave her morals and religious etiquette at the Pilot Gate before she went into the State House. I am looking for the ambassador of hijaab who refused to bedizen herself with the diaphanous cloth of jaahiliyyah even when she swam in affluence and power. I am enquiring about, you, my sister in whose time and resources the indigent and the physically challenged, Muslim and Christian alike, had a determined share through her pet project: I Care Women and Youth Initiative. I am missing Your Excellency, Hajiya (Dr) Amina Muhammad Namadi Sambo, wife of the Vice President who tarried with President Goodluck Jonathan. 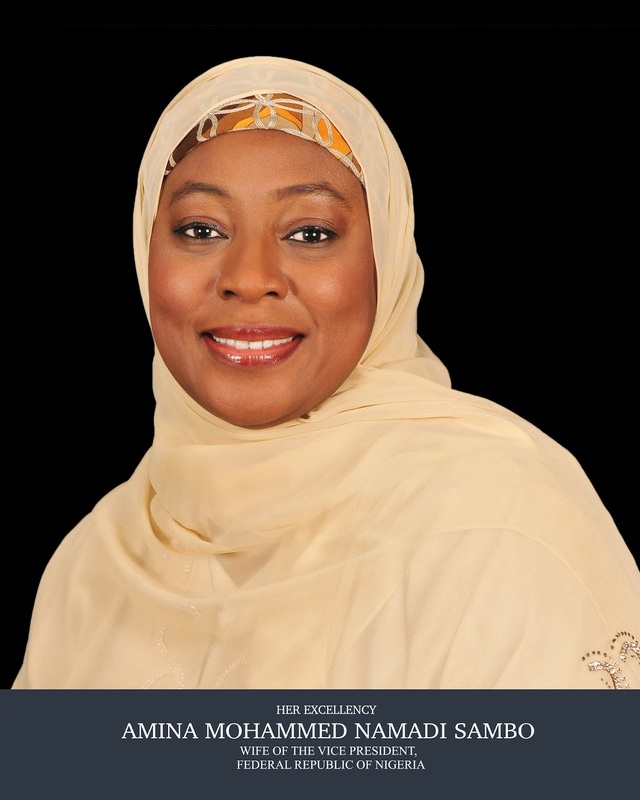 We did not meet physically either when you were the First Lady of Kaduna State, where I spent my formative years, or during your sojourn at the Presidential Villa, Abuja, but the media had made your image stick in the mind. I met you just before the election, when you attended a National Muslim Women Town Hall Meeting organised by the Office of the then Senior Special Assistant to the President on Islamic Affairs & State House Mosque, Barrister Tahir Umar Tahir at the main auditorium of the Women’s Development Centre, Abuja on Sunday, March 22nd, 2015. Dame Patience Jonathan, Hajiya Aisha Bala Mohammed, wife of the FCT Minister of the time, and my ‘mother’ Hajiya Zainab Maina, the then Honourable Minister of Women Affairs, among others, were at that event. I left that venue unable to even say proper “Salaam” to your Excellency (and other women on the high-table) because your bellicose boss, Dame Patience, discomfited me by her rantings. As one of the discussants of the paper on “Violence-Free Elections” I had humbly advised Mrs Jonathan to apologise and make peace with the people of the North whom she openly vilified in a campaign rally in Calabar (on March 2nd, 2015). At that rally, she said: “Our people no dey born shildren wey dem no fit count. Our men no dey born shildren throway for street. We no dey like the people for that side”. That side being the North, part of whose votes would determine the results of the elections. I had wanted to listen to your speech on that day. I had hoped to listen to your well-articulated English, an embodiment of real scholarship and deep learning, not the gibberish of pseudo PhDs who mutilate the language mercilessly and display utter lack of good breeding in their choice of words and carriage. Unfortunately, when it was your turn to speak, you declined; as “Her Excellency,” Patience Jonathan “had spoken, it sufficed.” It little sufficed, your Excellency. The loquacious consort to your husband’s boss was better off mute that day. She was too big to utter the words of apology, to feel compunction for the rancour her words left in the hearts of the people, but was not, of course, too big to be drowned in the tsunami in which “people for that side” played a major part! The list of the problems that led to the fall of the Jonathan government will be incomplete without the role of Dame Patience. I shudder to remember, as you do too, all the atrocious utterances of that woman against many people including you. I urge every politician to be wary of the actions and utterances of their spouse which can make or mar their political existence. Your Excellency, you stood out, as you did not exceed the limits of decency except where the bounds of Allah’s Laws were approached, in which case you flatly demurred! I remember, when at the Presidential Inauguration Dinner 2011, you showed that exception evidently. Your husband, His Excellency Architect Namadi Sambo and everybody else took part in the President Dance; all were on the stage entertaining the nation, which event was beamed live on television. That day, you saved the hijab from desecration. The footage from the Nigerian Television Authority (NTA) that focused on the table around which sat your husband, Alhaji Yayale Ahmad, the then Secretary to the Government of the Federation, showed there was a certain level of pressure on your Excellency to join in the dance and not embarrass the V.P by leaving him to dance alone. However, viewers could clearly see that you, as a bastion of the hijab were defiantly deaf to all Presidential entreaties, since there was no obedience to any creature, including ‘oga’ and his boss, in disobedience to the Creator! I have a lot of respect for your husband, your Excellency. In one of my sessions of Friday khutbah (sermon) translation at the Abuja National Mosque, I made comments in his presence, which was displeasing to some of the leaders of his party, the People’s Democratic Party (PDP); the details are not necessary here. However, after the adjudication and resolution of that incident by His Eminence, Sultan Muhammad Sa’ad Abubakar, I made it a duty to visit His Excellency, your husband, every Ramadan whenever he stayed at the Madinah Hilton Hotel, where I also accommodated pilgrims on my company’s package. That was the apotheosis of loyalty where all the people present were Muslims but His Excellency remained unchanged. The Arabs say if you revere the honoured, they reciprocate and appreciate you, but if you show loyalty to the undeserving, haughtiness drives them to thanklessness; they may even, wrongfully, suspect that you covet their position. Was this unfounded suspicion of nursing presidential ambition, then, the reason why, despite his loyalty, he was disenfranchised from access to the privileges of his exalted office? Was it why, albeit a blessing in disguise, he was not smothered with more from our commonwealth, thereby not making the sordid list of pilferers who devoured resources meant for the fighting of insurgency in the Northeast? I really wonder! You suffered nothing less than your husband did in the hands of his boss’s wife too. Your Excellency, remember the insults about your hijaab and how the uncouth woman would call those around you Boko Haraam to your hearing. Not in jest as some would imagine but with a callous and calculated attempt to make you feel inferior. A poorly educated upstart, who could barely string together a sentence in good English would look you in the eye and tell those around you that you are always dressed like “a bush woman”. How you endured all the slurs, insults, words of bitter hate against your religion and your religious dressing, the utter contempt for your right to go and offer your daily salawaat and sundry atrocities which I would have revolted against in your shoes remains a mystery and testimony to your good breeding. You upheld the quintessence of womanhood in Islam in your manners, which is less than I could say for the one whose nickname was the very antithesis of her actions. We are proud of you; may Allah reward you.